This third take on the bento features sushi. No, not the fishy kind. Making futomaki sushi (a type of makisushi that feature the seaweed wrapper) is actually really easy, as long as you have the ingredients and equipment. In fact, a lot of Japanese cooking is relatively easy and it’s only obtaining the supplies that can be a bit tricky. Futomaki sushi shouldn’t be confused with the typical “raw fish” sushi (or sashimi), or “California rolls” (even if they do share a slight resemblance to the latter). 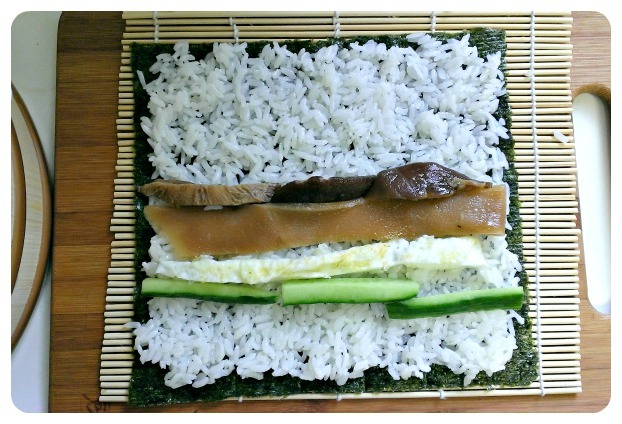 Futomaki sushi are often vegetarian and include cucumber, spinach (optional), egg, shitake, and kampyo (dried gourd). You can make the seasoned shitake and kampyo days before, and you can even freeze them for a handy supply for emergency sushi rolls or loose sushi rice (chirashizushi). I often cook up a big batch and then freeze them in separate packets with no harm (just remember to defrost them and microwave until warm, but not overly hot, before making the sushi). The English cucumber is simply cut into 4-5 inch long, thin rectangles and the egg is simply scrambled, cooked like a big pancake in a pan, cooled and sliced into long strips. Nothing fancy or tricky. It’s all very simple and the beauty of sushi is that you don’t have to be perfect! It’s rolled and cut up anyways, so no one’s the wiser. Rolling the sushi can be slightly tricky, if you don’t follow a few key tips. 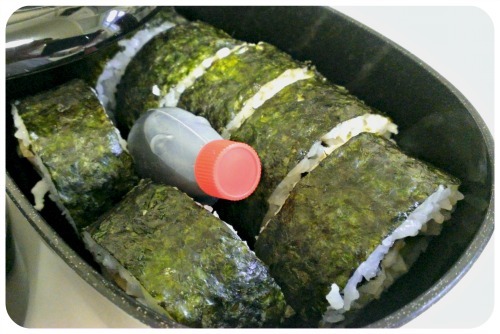 Dip your fingers into a bit of rice vinegar to help spread the prepared sushi rice (which is just rice vinegar and sugar to taste) over the nori (seaweed wrapper). If you don’t, you’ll have sticky fingers and no luck. Spread the rice more thinly at the edges – especially at the opposite end from where the ingredients are placed. Place your ingredients in rows with equal spacing at one end of the roll nearest to you. If you lump it all together or spread it all over the roll like a cinnamon bun, it won’t roll correctly and you’ll have problems lining everything up. Roll from the end where the ingredients are closer to the edge. This way you can “tuck” the ingredients into the middle of the roll. After you’ve rolled the sushi, gently but firmly squeeze the roll with the mat still around it so that it stays together. This isn’t really important, but if aesthetics is your thing, place the shiny side of the nori face-down onto your mat for a prettier roll. I find that futomaki sushi lasts a day or two at room temperature as long as it’s in a sealed container, but do be aware that if you fridge it, the rice will harden a bit. I have yet to experience any problems with sushi in bento without being chilled, but I wouldn’t want to advocate it in case there’s some issues with bacteria. If it scares you, then go ahead and fridge it. Prepare the kampyo by washing it in water and then vigorously rubbing salt all over. Rinse and place kampyo into warm water for at least 30 min to reconstitute – the kampyo is done soaking when it has expanded. I generally soak my kampyo and shitake together in the same bowl. Place kampyo, shitake and the other ingredients into a medium saucepan and bring to a boil. Reduce heat to a simmer and cook until liquid is reduced to about a 1/4. Take off heat, let cool, then slice the shitake into about ¼ inch strips and the kampyo into about 12 inch strips (long enough to fit the length of the nori). Store in the fridge or the freezer for future uses. 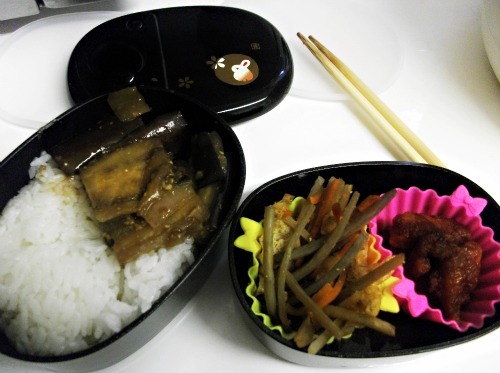 Categories: Bento, Recipes | Tags: bento, japanese, Recipe | Permalink. There’s something so culinary-ingly satisfying about a bento. The task: Fill this small 5 inch oval, two tiered container with an assortment of veggies, protein and rice. My hubby is the kind of person that can eat the same thing every Sunday, but I’m a creature of variety. Even though he gets a bento once a week, it still bores me when I have to put together the same meal – especially if it’s supposed to be a “real” meal and not a typical lunch of yogurt and GoLean. So, his bento is at the mercy of my own whims and this weekend I felt like daikon! I had bought a nice sized specimen at the local Asian market, and it was in the crisper waiting for a good use. I wasn’t sure what I wanted to do with it (there were so many things that I could think of), but the cold snow and gray skies made me feel like having a warm pot on the stove filled with soft, seasoned bits of daikon and bright green edamame. I was also a bit bored with the gobo version of Kimpira (which is simply stir fried julienne root veggies) so I made it with celery instead. Most root veggies work well as long as you soften them a bit before sautéing them in the pan. My celery was beginning to “spread its branches” so to speak, so I knew it would be a great way to help use it up and get a bit of variety at the same time. 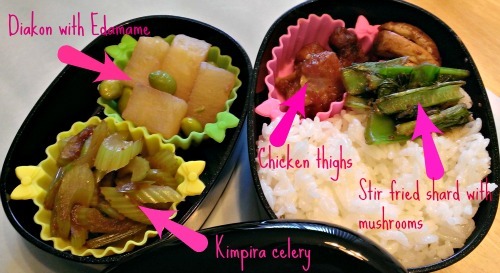 A book that’s been inspiring for me is Naomi Kijima’s Bento Boxes. In it, there are simple recipes for a wide range of meals, some of which my hubby wouldn’t care for, but it does give me inspiration. It isn’t filled with how to make your egg into a cute bird or your apple slices into rabbits, but it does contain many practical and filling recipes that I remember eating growing up. Most recipes are tweakable, so I flip through, match ingredients somewhat, and prep for Sunday. It’s a relatively simple task and one that gets the cooking side of my brain sizzling. My only wish is that I’d get the timing right. 😕 Sometimes I’m done right when I need to get ready for work myself, and other times I’ve got time to spare to eat my own thrown together meal (that’s another bonus for making bento – I usually can eat the same sort of thing since I’ve already cooked most of the components!). Chop daikon into about 1 – 1 ½ inch round disks. 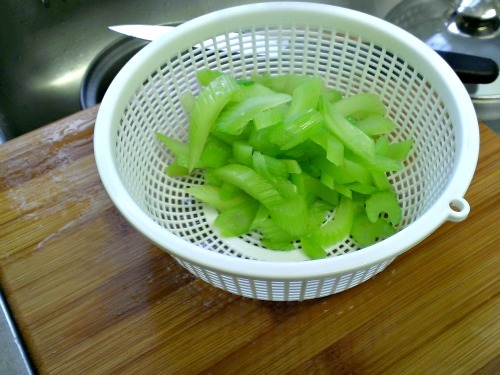 Cut disks into quarters and place segments into a pot of boiling water (about 2 cups of water – you want the daikon to be covered with water). Boil for about 10 minutes. Add the seasonings to the pot and continue to boil for about 15 minutes. Add the edamame and continue to boil until liquid is reduced to 1/3 and the daikon is soft. If you’re adding this to a bento, serve without including the liquid or you might have a spillage issue. 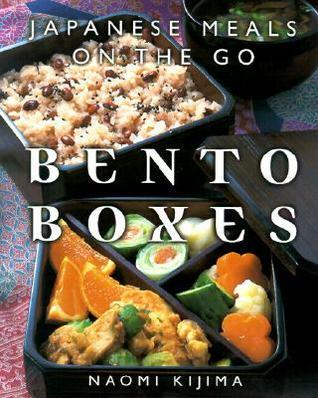 Categories: Bento, Recipes | Tags: bento, books, japanese, Recipe | Permalink. Fridays are currently the only day where our work schedules don’t match up – I’m off to work while the hubby stays home. This doesn’t bother me, but I definitely notice how much more dull and boring work can be when he isn’t there. I’m the first out the door at the end of my day, with a few jokes trailing behind me from coworkers about how quick I am to pack up and scuttle out. With Valentine’s day being on a Thursday, we were able to enjoy the whole day without work and without a schedule. 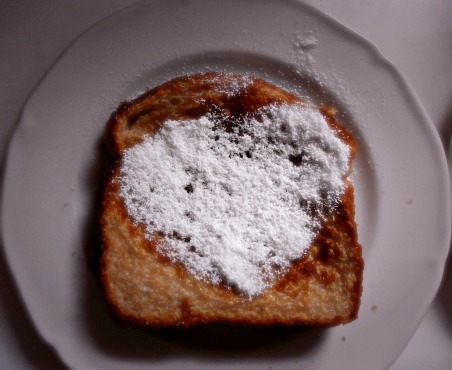 Pizza was devoured, french toast festively sprinkled, and gifts exchanged. We even worked in a lovely cuddle on the couch with Columbo on our telly. While others might have been dancing the night away in satin and heels, we were in our comfy clothes with homemade mocha and a blanket to share. Never take for granted the comfort and sense of belonging love provides. One thing that was different this Valentine’s day was our more health-conscious approach. Recently, my hubby has started to watch how much he eats by counting his calories. He clocks his eats and exercises on his phone and has lost weight, but he’s gained so much more – a sense of quantity. Before, meals were eaten based on how hungry he was or how delicious the food was – not a bad thing, necessarily, except when it was getting out of hand. His weight was creeping up while mine was going down. I had never really pressured him to watch his calories, since my own health “movement” was a personal decision and I’m not one to preach. Sure, I made a few changes that affected his plate, too, but it was more on an ingredient level and not on quantity. So imagine my surprise as I watched him carefully consider his food options and eat food that was portioned and (for the most part) healthy. I’ve been helping him measure, calculate and stay within his target by making meals for him that are still tasty but more healthy. I bought this cute little bento box at my local Japanese store and it’s a standard meal for his long work days during the weekend. I fill it with about a cup of rice, two or three vegetable sides and a bit of meat (here there’s chicken wings in the pink cup, kimpira gobo in the yellow cup, and a miso eggplant dish next to the rice). The entire meal comes out to about 300-500 calories depending on what I pack in there, but it’s so much more filling and healthier than the sandwiches he was eating. The container has lids and keeps it all warm for when I arrive to drop it off at his desk. I love making the meal for him and it’s even more gratifying to see his smile when I hand it over and he’s hungry. 🙂 It takes a lot of courage and strength to fix one’s eating habits, and I’m completely proud that he’s giving it his own go. And I’ll cook for that smile any day! 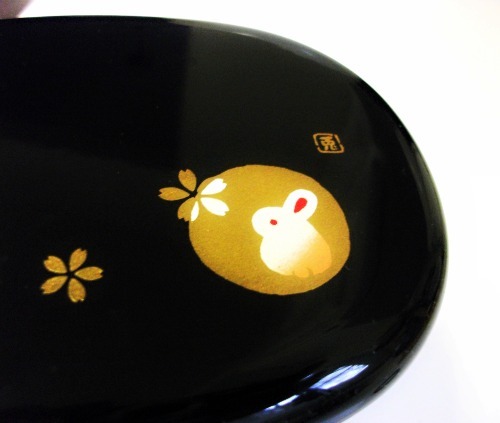 Categories: Bento, Musings | Tags: bento, happiness, Health, willpower | Permalink.